Accepting donations from White Supremacists, and Accusing the Mossad of trying to blow up the World Trade Center. 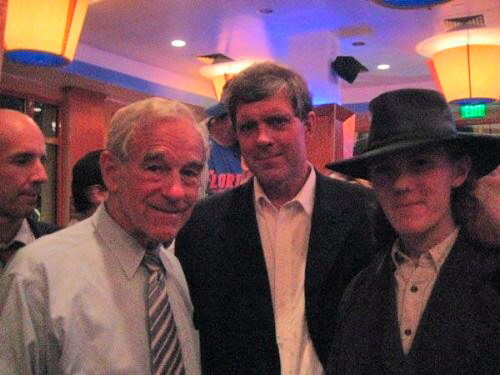 In one of the most sad, cynical, and disgusting moments of the 2008 presidential campaign, the Associated Press is reporting that Republican presidential candidate Ron Paul has refused to return a campaign contribution from Don Black, who runs a vicious White Supremacist website. Rep. Paul's spokesman's pathetic excuse for keeping the money was that "If someone with small ideologies happens to contribute money to Ron, thinking he can influence Ron in any way, he's wasted his money," and that "Ron is going to take the money and try to spread the message of freedom." The spokesman, Jesse Benton also, pitifully noted, "And that's $500 less that this guy has to do whatever it is that he does." Even if Ron Paul had not recently set fundraising records, this excuse would still be an insult to the intelligence of voters. Given his fundraising prowess, the excuse is doubly insulting. If Rep. Paul refuses to stand up to hate-mongers like Don Black, it is fair to ask whether he is tacitly welcoming their support in a desperate attempt to gain traction in the Republican primary. And, if the other Republican candidates do not condemn him for this, it will send a similar message as did their refusal to condemn Ann Coulter. "The rhetoric when it came to Jews was little better. The newsletters display an obsession with Israel; no other country is mentioned more often in the editions I saw, or with more vitriol. A 1987 issue of Paul's Investment Letter called Israel "an aggressive, national socialist state," and a 1990 newsletter discussed the "tens of thousands of well-placed friends of Israel in all countries who are willing to wok [sic] for the Mossad in their area of expertise." Of the 1993 World Trade Center bombing, a newsletter said, "Whether it was a setup by the Israeli Mossad, as a Jewish friend of mine suspects, or was truly a retaliation by the Islamic fundamentalists, matters little." "While bashing King, the newsletters had kind words for the former Imperial Wizard of the Ku Klux Klan, David Duke. In a passage titled ‘The Duke's Victory,’ a newsletter celebrated Duke's 44 percent showing in the 1990 Louisiana Republican Senate primary. ‘Duke lost the election,’ it said, ‘but he scared the blazes out of the Establishment.’ In 1991, a newsletter asked, ‘Is David Duke's new prominence, despite his losing the gubernatorial election, good for anti-big government forces?’ ‘The conclusion was that "our priority should be to take the anti-government, anti-tax, anti-crime, anti-welfare loafers, anti-race privilege, anti-foreign meddling message of Duke, and enclose it in a more consistent package of freedom.’"